Josie got to be OBSESSED with ferrets last year... maybe more than last year? I can't remember. She'd draw ferrets, watch videos about them, check out books about them from the library. All I knew was that they smelled funny and were kind of shaped like socks. I resisted this ferret idea for quite a while. but she kept at it, and I think marc was secretly into it too. he helped her make one of her ferret ideas into a screenprint to make t-shirts for a fundraiser. oh yes they did. she raised $60, which is what we'd told her an adoption fee runs for a ferret at the humane society. well once there was a community of people behind the idea it got harder to say no. 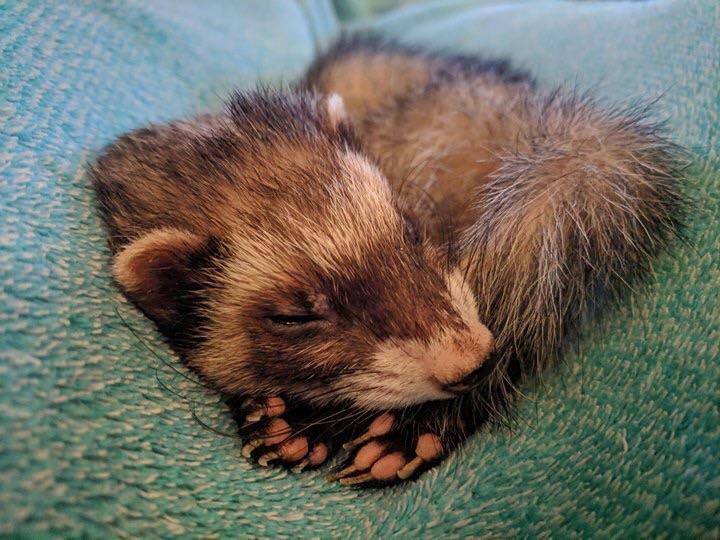 so I helped, I found a big cage on craigslist, found another family trying to rehome a ferret, and there you go, now we are a ferret family. frankie has two modes... super bouncy, and sleeping. when he's running around being bouncy he looks like the back half and front half of his body don't really coordinate much. we block in the living room and just let him run, or josie carries him around the house. he's much easier to carry than a guinea pig. guinea pigs constantly want to jump to their death when you carry him. he is happier being carried, less interested in jumping off you, and significantly more likely to survive the fall unscathed if he does. he spends the other times in his cage, folded in half sleeping. there's a litter box in there and he's pretty good about using it, and josie is pretty good about cleaning it. I have lost track of whether our house smells like ferret. it probably does. so our current pets: two molly fish both named juju, a pleco fish named mr. french fries, judy the dog, and frankie the ferret.